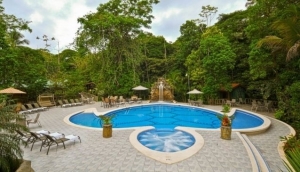 Looking for a cabin overlooking a gorgeous waterfall or next to a meandering river?Perhaps your preference is on a mountainside or the dense jungle where you can wake up to the sounds of howler monkeys and toucans. Costa Rica cabins or Cabinas are offered from the shores of the beaches to the tops of mountain peaks. If you really want to be alone you can easily find a cabin in the middle of no where, or a beach with a town close by. Cabins are common and the choices vary. Use our tabs to locate yours.